For Christmas my sweet husband surprised me with the HP Photosmart C6280 All-in-One Printer, Scanner, Copier!! I'll be spending some serious time with the manual to learn all about it! We had a great Christmas. We got many things to get the house set up. I'm looking forward to getting back to the daily routine. I'm not looking forward to the mound of boxes still to sort through. But I'm motivated by the thought of sitting in front of my still life and painting away for hours. Oh look! I got my camera up and running. Now where are those printer cables? This past fall I had to pack up my studio to make the space look like a dining room again. This was to prepare the house to sell. I did set up an area in the basement so that I could paint. But, with all the work to do to get the house ready to sell, there wasn't much time for art. I now have a great space for a studio and even a separate office. The frustration now is trying to function and get something done only to find out that what I need is in some box somewhere. I still have a large mound of boxes to put away. What I am referring to is not being able to find my printer cables among other things. Christmas Holidays and getting settled into a house don't leave a lot of time for art. The painting I'm doing nowdays is mostly on the walls. 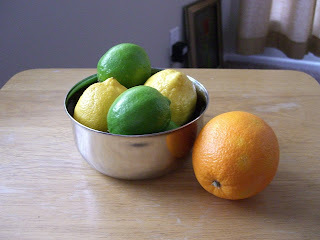 I set up a lovely still life of citrus in a stainless bowl. But because of all of my diversions, the lemons and limes have begun to shrivel. The orange has been replaced once already. I scrambled to take a picture of it so that I could remember it in all its freshness and have a reference to finish it after Christmas. Great idea if I knew where my printer cables were. Thank heaven for Walmart one hour photo service. I would post the picture but you can probably guess there are some bugs to work out there as well. With Christmas this close and all the things left to do I probably shouldn't paint until after. But at least I have my picture!